I don’t think I truly saw New York until I saw it from the seat of my bicycle. Suspended between air, tires, and pavement, I occupy the transcendant space between man and machine. Now that I have a bike, New York has become a giant playground. Forget crowded subways, dark tunnels, cramped, stuffy platforms. Say hello to the wind in your face, the river at your side, the sunniness of the streets, and seeing skyscrapers from every angle. This is the first of several suggested biking itineraries I’ll be posting on When Nutmeg Met Basil. All you need is a bike, a helmet, a backpack, a bike lock, and a free day. If you are lucky enough to have a biking buddy like I do, then make sure to bring them along. If you love photography, your bike can take you to the best photo spots in the city. I’ve noted these in the itinerary below. 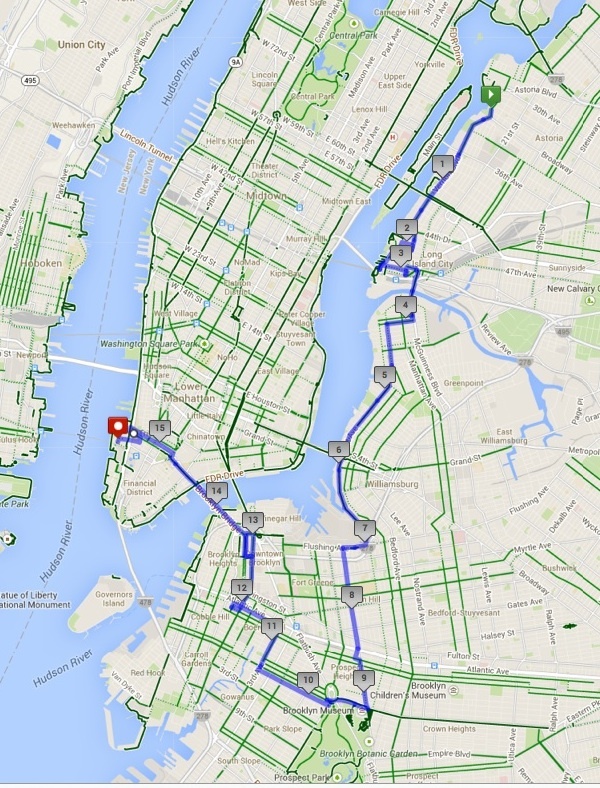 Start in Astoria, Queens and pedal west toward Vernon Boulevard and the East River. 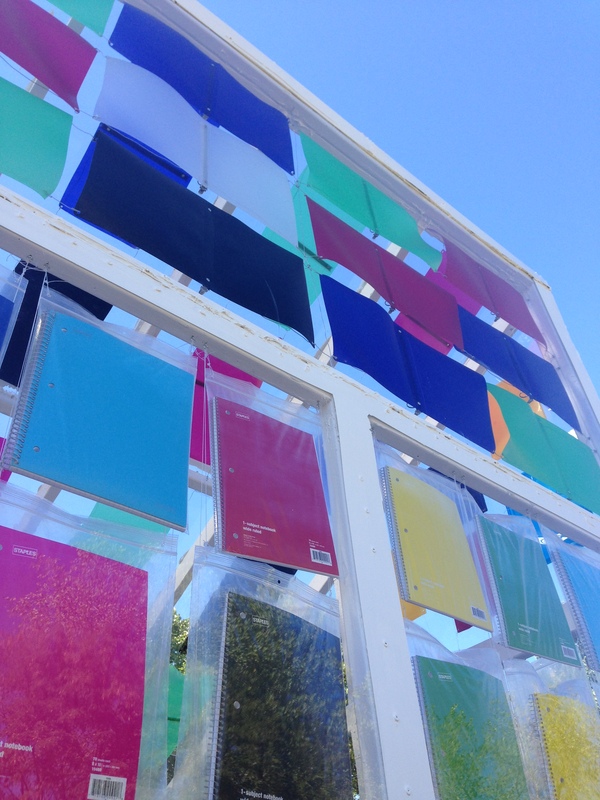 Stop off at Socrates Sculpture Park, where you can explore EAF2014, the annual Emerging Artists Fellowship exhibition, which was installed in early September.You may want to play on the sculptures. Lots of photos to be taken here. Continue down Vernon past the Queensboro bridge until you reach the LIC Flea & Food. 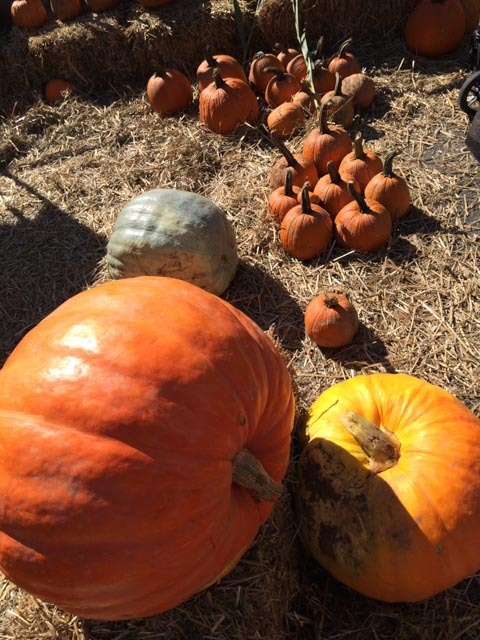 Lock your bike at the rear entrance to the fair and sample local snacks from Khao Man Gai NY or the King of Falafel — or enjoy the simple pleasure of frolicking with the pumpkins. Do take a moment to master the bean toss – it will give you a sense of accomplishment that will prove useful on the rest of your ride. Grab your bike and proceed to Gantry Park. Photo opportunities abound as you ride or walk down the waterfront into Hunter’s Point Park South, which opened for the first time last fall. 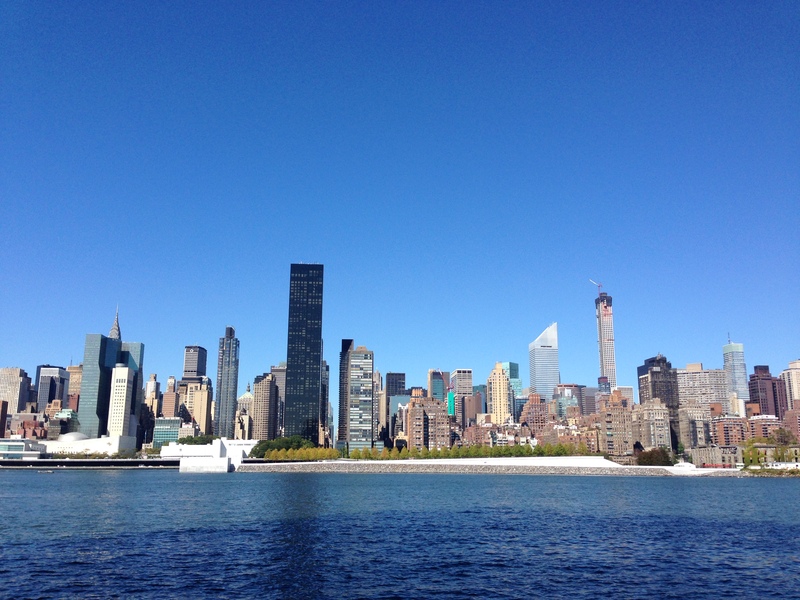 Kahn’s new Four Freedoms Park on Roosevelt Island stands in between you and Manhattan’s East River skyline. You’ll pass plenty of places to sit and take in the view. If you’d like, you can stop at all of them. Note: Bathroom break available in the trailer to the side of the park. You’ll reach it about halfway through the walkway. 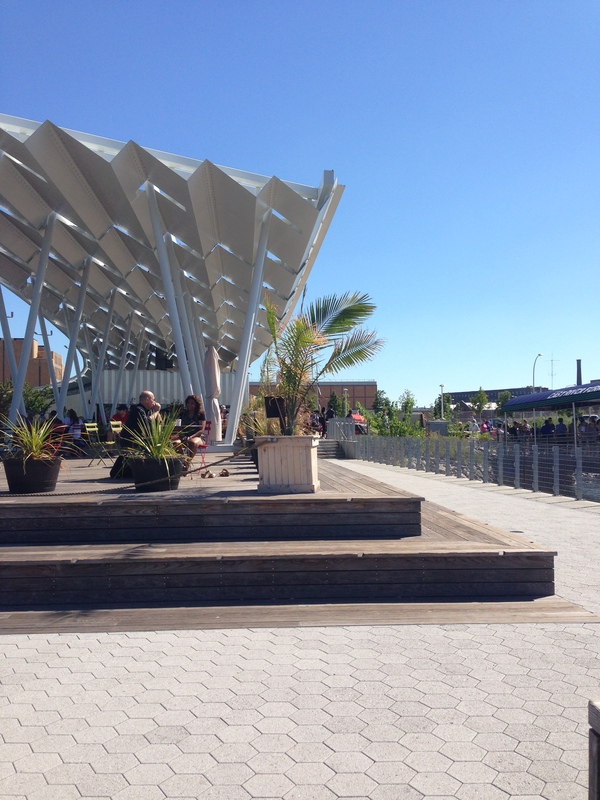 If you’re feeling sleepy, pause for a coffee at LIC Landing by COFFEED, the outdoor café at the end of the park. Linger on a wooden deck chair. New York is your playground. There’s no rush! As you exit the riverwalk, follow signs for the bike route over the Pulaski bridge. Welcome to Brooklyn! 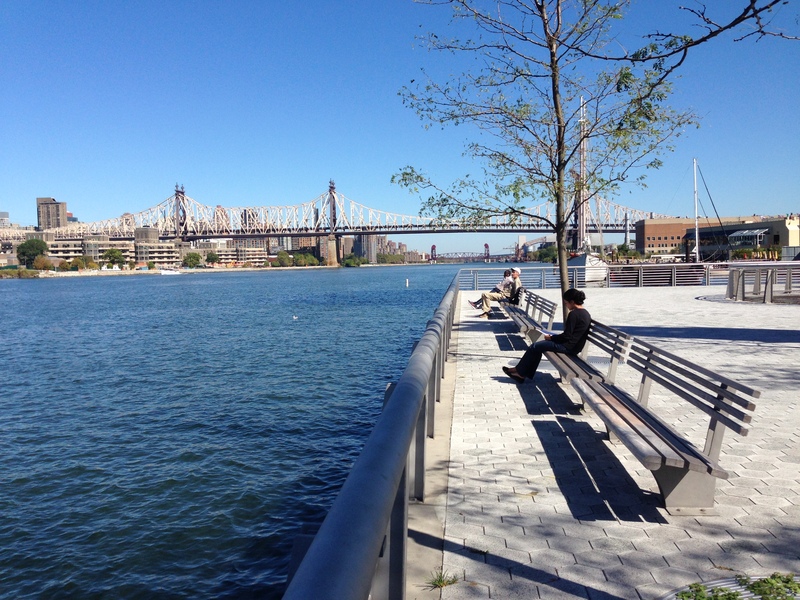 More waterfront cycling awaits you in this bike-friendly borough. Make a right on DuPont and a left on Franklin. Continue south on Franklin until you reach Bushwick Inlet Park, where I recommend stopping to dance in the sprinklers, enjoy the view, or use the public restrooms. 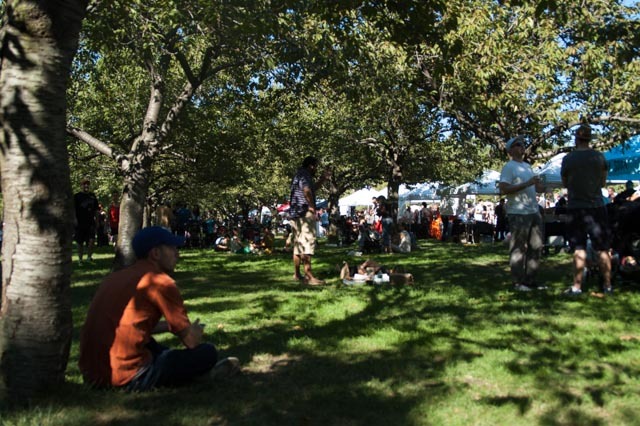 A few blocks ahead lies the legendary Smorgasburg… brave the Stumptown-fueled crowds fighting for a ramen burger if you dare! Continue on to Kent Avenue and sail past cars, pedestrians, trees, buildings, and dogs. 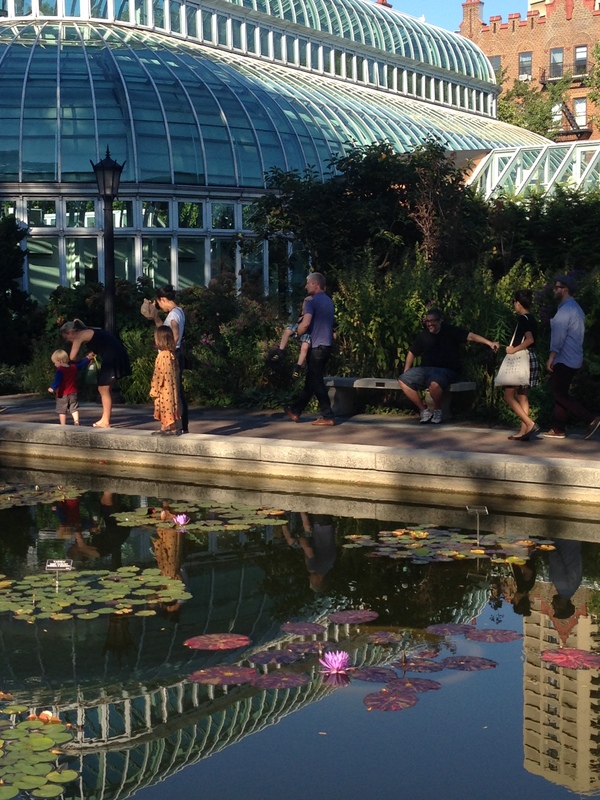 You’ll leave the waterfront and chart a direct course for the Brooklyn Botanic Garden, which offers a welcome respite from traffic and marks your half-way spot. Once you arrive, search for bike parking on the sidewalk in front of the Washington Avenue entrance. Enter and proceed directly to the Rose Garden. You’ll want to check out the the Shakespeare garden (several rows of plants mentioned in Shakespeare’s plays), if you’re an English major slash plant nerd like me. 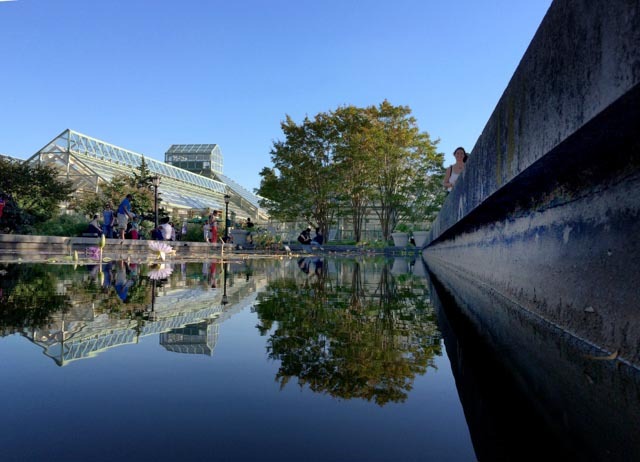 Take a walk through the Japanese garden, as well, and pass through the lilypad plaza in front of the conservatory. You’re on your way to the vast expanse of open green where you can collapse, with an ice cream bar from the café if you feel you deserve it. Take as long as you need to lie back in the grass contemplating the trees and reveling in the peace of this rare urban oasis. Over the bridge and through the park and across lower Manhattan, you’ll find yourself at the ferry, where $3.50 buys yourself and your bike passage on a three minute voyage to downtown Jersey City. This is convenient if you have friends that live there, as I do. If so, I highly recommend tacos and margaritas at Taqueria Downtown followed by ice cream at Milk + Sugar. 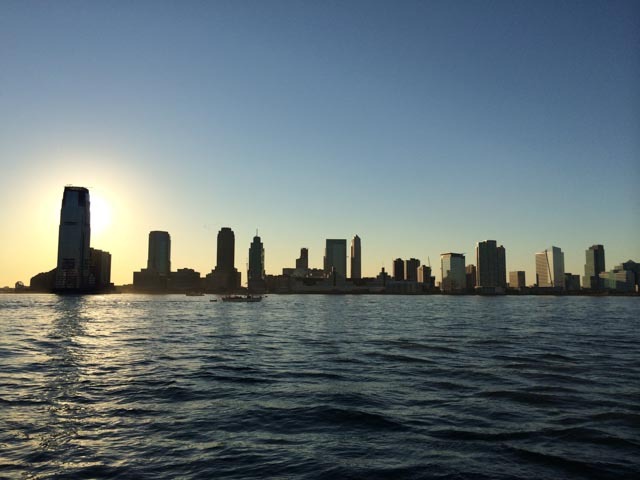 If not, you may want to skip the ferry and stop for dinner instead at the nearby Shake Shack. Either way, make sure to refuel. You’ve earned it!